Located in the sleepy town of Munébrega, Bodegas Breca was founded by Jorge Ordóñez in 2010 with the mission of producing the finest Garnacha in Aragón. Garnacha de Aragón, the clone used to produce the wines of Bodegas Breca, is the most ancient and genetically untouched clone of of Garnacha (Grenache) in the world. Garnacha was first cultivated in this northeastern corner of Spain, and transplanted across the Mediterranean by the medieval Kingdom of Aragón, which had territories across the Mediterranean. D.O. Calatayud has a very unique, extreme terroir. The combination of radical altitudes, diverse slate soils, and drastic climate combine to create a completely unique mesoclimate. 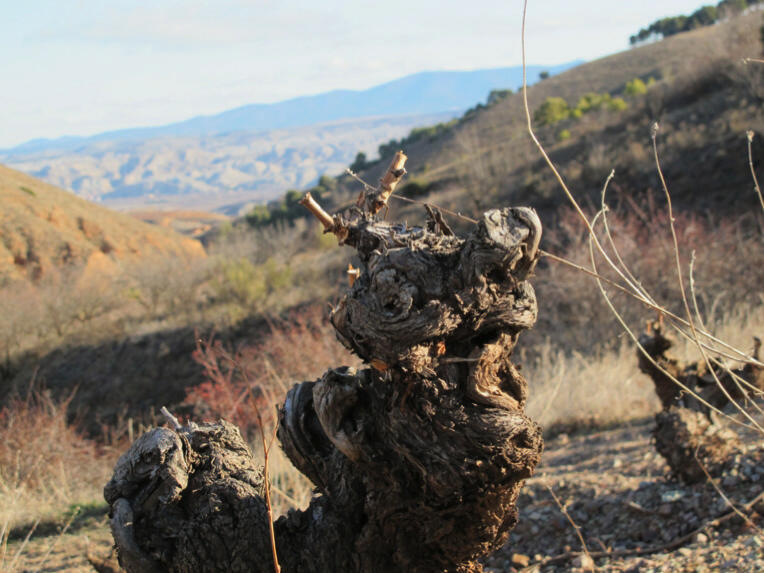 As Spain's highest region for the production of Garnacha, Calatayud frequently sees temperature swings of 45˚F between day and night. In our mountainside vineyards (2600-3500ft. ), our vines are oftentimes exposed to 40-100˚F diurnal temperature swings in the summer. The heat allows the grapes to achieve full phenolic ripeness, and the cool nights build high acidity in the grapes. Due to its long vegetative cycle, Garnacha requires a relatively dry, hot climate to reach proper phenolic ripeness. The cold nights, dawn, and dusk, combined with a variety of slate dominant soils, allow the grapes to reach high levels of acidity. Our head trained vineyards were planted between 1900 and 1975, and as with all of the Grupo Jorge Ordóñez vineyards, they are dry farmed. These conditions produce exceptionally balanced wines with ageing potential due to their concentration and acidity. Garnacha, most famous internationally for its French name Grenache, is a grape cultivar that was most originally planted in the Kingdom of Aragón in the northeast of Spain during the Middle Ages. Transplanted across the Mediterranean by the Aragonese, who had holdings in southern France and Italy, the original Garnacha evolved into more productive clones now planted in Southern France – the same clones that are famous for the very aromatic, lighter body and color wines that they produce. The most widely planted red grape in the world, the vast majority of the Grenache plantings are of these more modern, unauthentic clones on trellis. However, in present day Aragón, it is still possible to find vineyards of these old clones planted up to a century ago in decomposed iron rich red and black slate soils." Jorge Ordóñez pioneered the introduction of Garnacha into the United States in the 1990s, when Garnacha was the most widely planted grape in Spain. At the time, however, all of the Spanish red wines available in the American market were Tempranillo dominant. Jorge recognized the quality of the old vine plantings of Garnacha and and the wines they produced, and exposed the United States to these sensational wines. Jeb Dunnuck 95 “The flagship Grenache from Breca is the 2014 Brega. One hundred percent Grenache from higher elevation, hillside parcels and aged in 40% new oak, it offers a powerful, pedal-to-the-metal style in its ripe black cherry, melted licorice, roasted herbs, and meaty aromas and flavors. Robert Parker 94 "The estate’s oldest vines are utilized for the 2010 Breca, also 100% Garnacha from vines that were planted between 1925 and 1945 in decomposed slate and gravelly clay soils. Yields were less than one ton of fruit per acre, and the wine was aged in old large French oak foudres.